How to convert any scorecard into a really agile business tool? Keep it simple… simple and highly focused! If you have just a few minutes a day to track business performance, focus on these must-have performance indicators. When your organization is in the calm waters, having a long list of performance indicators sounds like a good idea. You have time to analyze various metrics from the viewpoint of different perspectives and focus on even minor improvement possibilities. 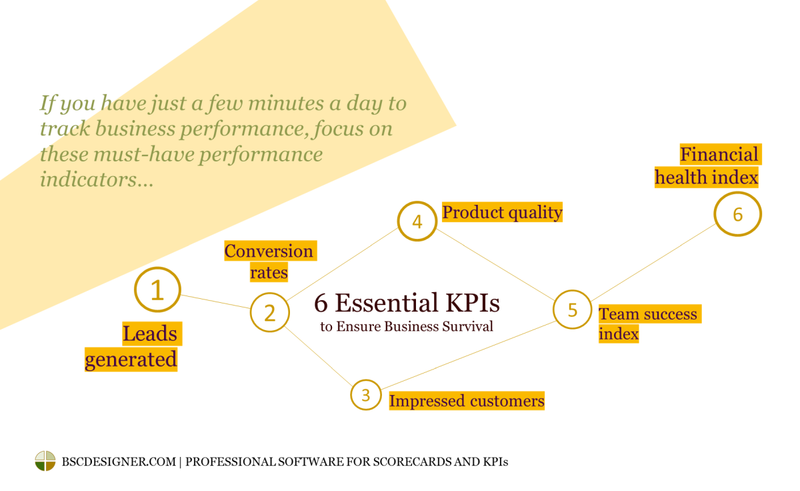 6 Essential KPIs online - sign-up with a free account for immediate access to 16 scorecard templates. What about tough days when resources are limited, management is busy with fire-fighting, and looking at the performance dashboards sounds like a waste of time? In that case, having hard data to support business decisions is even more important, but we don’t have the luxury to track 100+ metrics, so we must focus on the most important ones. Getting new customers. Performance metrics for marketing and sales. Making customers happy. Key metrics for customer service and product quality. Keeping team busy and happy. Performance and engagement metrics for your team. Cash flow. Key financial indicators to ensure positive dynamic of the cash flow. Below you will find examples of the performance metrics (KPIs if you want) together with some use instructions. Make sure you have those metrics on your dashboard, especially during crisis times. Prospective customers are the leading factor of your future cash flow. If things go wrong and there are no new signups for your Cloud app or people prefer a new supermarket next door instead of your small shop, then something needs to be changed immediately. Metric 1. Leads generated. What are the acquisition numbers? For example, website visitors, newsletter subscriptions, case study downloads, daily visitors to the shop, etc. Metric 2. Conversion rates. What are the conversion rates between different levels of your marketing funnel? For example, from the prospective customers who attended a live demo to the paying customers. How good are you in converting those leads into paying customers (metric 2). Have a bird’s eye view of your business to get these numbers. If the challenges are not visible from the first sight, then dig deeper into specific lead generation channels and lead conversion tools. Here we are talking about providing customers with what they expect – a high quality product and excellent customer service. Let’s skip the obvious ideas that there should be customer service, and someone should respond to calls and emails. What is often missed is that a business needs to listen to the customers and learn from them. If there is a problem with lead generation or product quality, an angry customer normally won’t call and won’t tell you why they prefer not to buy your product; on the contrary, your loyal customers might mention something.Make sure your team captures these less obvious feedbacks (here are some ideas about how to improve that skill). A customer service scorecard might include various KPIs. Our goal is to pick 1 or 2 you need to focus on. The easy choice would be NPS (Net Promoter Score) metric, but for my opinion this metric is too general and can be easily biased. Metric 3: Impressed customers, %. Track the percent of customers who were impressed by the high quality of the service provided. Was a client impressed by a super-fast and detailed response? Was the fix to the problem delivered unexpectedly fast? Obviously, the quantification of this indicator is subjective, but with a good team (see what I mean below) you can manage this. Look back at the previously attended customer queries – could your team do better? Besides having an excellent customer service, there is another pillar of keeping customers happy – providing them what was promised at the highest quality. Metric 4: Product/service quality (as perceived by your potential clients and paying customers). We discussed this in details in the Customer perspective article. In your case this metric might be as simple as “Onboarding time” or as detailed as “Product architecture complexity.” Find the one that corresponds to how your prospective customers and paying clients perceive quality. Marketing-related (metrics 1 and 2)? Generally speaking, burning marketing money on a mediocre product is not a good idea, but if you are in a new market, and already have some interesting features, then customers can forgive you for some quality issues (at least for some time). If marketing, sales, or customer service don’t work as expected, look back at your team and your management efforts. I believe that most individuals have or can develop a strong intrinsic motivation, so we are not talking here about money rewards and incentives schemes. In any organization there are three key areas we need to look at in the context of employee challenges. Make sure you have the right people working in your business. It’s not just about measuring the performance, it’s about tracking soft skills as well. Track the way people communicate to the clients, quantify how one member of your team influences his or her colleagues. A 360-degree analysis might be a good starting point for this kind of quantification. Give your people the necessary tools to do their job. I’m not talking here about providing a desk with a computer – think about all routine tasks that could be automated, think about outdated product architecture that affects morale of the engineers (yes, morale can be quantified as well). Think about your management style (quantify it in the way discussed here). Make sure that your employees understand how they can contribute. Make sure they have clear goals and tangible steps towards them. If you need a quantitative indicator for strategy awareness, then ask members of your team to explain the strategy of the organization in simple words. Count the percent of the correct answers – you might be surprised by the results. A solution plan to this challenge might include an OKR framework that we have discussed recently. When the basic issues were addressed, focus on improving specific behaviour patterns (=culture). Quality assurance coverage, %. How does your team treat problems found in the product? Do they simply fix them, or are they doing a root-cause analysis and trying to come up with a prevention plan? Mark those that now have a prevention plan for similar challenges. Some basic calculations will show how good your team is at quality assurance. Don´t like the numbers? Discuss with your team how things can be done better in the future! Metric 5 (index): Team success index. Put inside metrics for the most emerging topics that you have discovered. Alternatively, you can browse some HR related articles on our website, to pick the metrics that resonate the most with your current situation. Cash flow. Do you earn more money than you spend? Remember to look at cash flow in dynamic; ask a question: how does the cash flow change over time? LTV/CAC ratio that tells us how efficient marketing is. Customer acquisition cost (CAC). The average price you need to pay to get a new customer. Customer lifetime value (LTV). Your expectation of the net profit related to a new customer. Metric 6 (index): Financial health index. For example, it can include cash flow and LTV/CAC ratio metric. Users of BSC Designer should skip this part as building an index in BSC Designer is as simple as drag-and-dropping indicators; normalization and weight calculation is also done automatically. Normalize the performance of each metric in the group. E.g. we need to use certain scale to convert $, m2, days, calls/hour into percentages to make metrics comparable. Assign weight to each metric. For example, the weight can be defined on a 0…1 scale. Calculate the performance of the index metric as a weighted average of normalized performance of each individual metric. You can find more details about scorecard normalization, using weights, and calculations in this article. Last but not least: performance measurement is important, but it should not take too much of your valuable time. Find an appropriate automation tool for your scorecard. You can start with a simple dashboard in MS Excel or choose a professional software. Before we discussed some advantages and disadvantages of each approach. Users of BSC Designer are welcome to start with a free scorecard template provided with this article. What do you think about the discussed top 6 metrics? What metrics do you focus on in your organization? 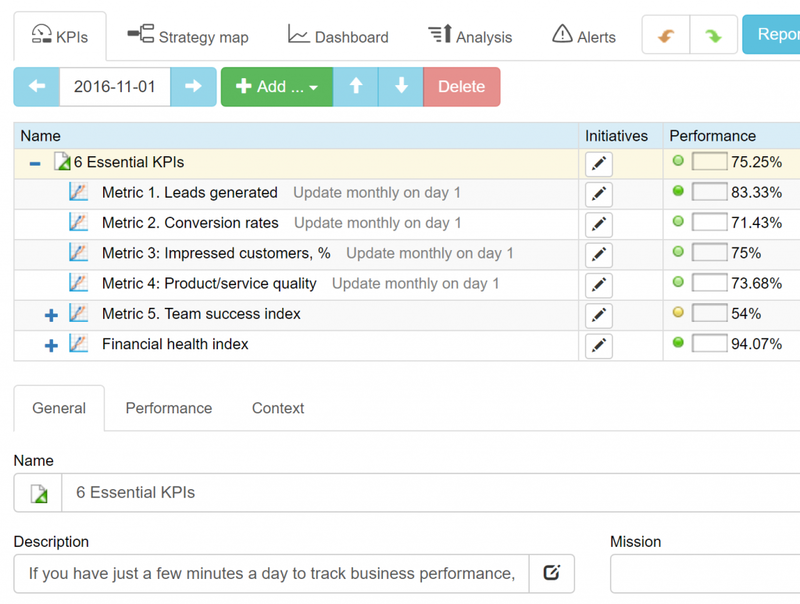 6 Essential KPIs discussed in this article as a starting template for your own scorecard! Instead of focusing on all possible improvement tactics let’s focus on ones that are relatively easy to implement, but drive visible improvements in a short period of time. In a case of success, the person who suggested those tactics will gain some political credits and prepare ground for future improvements. Among all possibilities, focus on those parts of the business system that are limiting your performance. Thinking in this way will help reduce the number of less useful metrics and focus only on those few indicators that are actually “key” for your business. Sometimes this approach looks like fire-fighting and some long-term perspective might be ignored, but at least your team will be clear about where the priorities should be right now. Knowing what is limiting your business is a good starting point, but what is even more important is to understand how to extend these limits. Look for the ways to change, and respectively find the metrics that will help to confirm that you are on the right track with the changes. For example, delivery service might find out that their bottleneck is the number of trucks on the route. A change goal in this case might be switching some deliveries to a delivery service with drones. You might argue that delivery with the drones is a significant innovation, and it’s hard to find something similar in our niche. That’s true, but at least your team will now know where to focus their innovation efforts, and what changes can drive significant performance improvements. Many organizations have a goal of improving profits by X% next year. One of the ways to make this goal more tangible and actionable is to build a funnel model. How well is our business attracting potential customers? How well is our business generating leads? How well are the leads being converted into paying clients? Draw a money/value/customer flow and use it to understand what can be improved. Small improvement on each level of the funnel will lead to significant improvement in overall performance. Let me use some simple math to illustrate the power of funnel metrics. For example, we have a 3-level sales funnel with a 5% conversion ratio between each level. On the first level, there are 10,000 prospect customers (for example website visitors), then there are 500 qualified leads (for example, those who downloaded the white paper), then there are 25 sales. The overall goal is to increase sales by 20% up to 30 sales. One way to do this is to increase the number on the first level by 20%, but we can also work with the conversion ratios. What change in the conversion ratios would give us a desired 20% increase? 20%? 10%? No! Actually, in this case we just need to increase both conversion ratios by 0.5%! The good thing is that we can build a funnel model for any aspect of the business from sales to innovations. A lot was said about the importance of the culture in the organization, including the performance measurement culture. In my book, I talked about the ways to change the culture, but in this article, I promised to share only ideas that will drive fast results. That’s why I suggest the following practical exercises. Present the idea of “KPI freedom” to your team. Allow (and obligate) each member of your team to select 1 metric that he/she wants to use as a key one. This metric should be relevant both – in the context of the company’s overall performance and in the context of a person’s daily job. Be prepared for some interesting and unexpected discussions provoked by the different ways people see their responsibilities and their impact on the overall performance. Take a chance to better explain where the company is aiming and how top managers plan to achieve the goal. A strategy map is a good catalyst for such discussions. Such discussions will be more productive if there is someone to explain the difference between the process and the result metrics, as well as the difference between leading and lagging metrics. Do it without any additional comments or explanations, just visualize 1-2 important metrics on a big screen that your team will see each day. Make sure you show the current performance and the historical trend. I would keep it in this format for a while. If you are lucky, your team will soon start asking about the numbers, what they mean for them, and if/how they can contribute. Then, further discussions can be supported by strategy maps and more detailed dashboards. Use professional strategy execution software, like our BSC Designer, to automate some routine aspects. 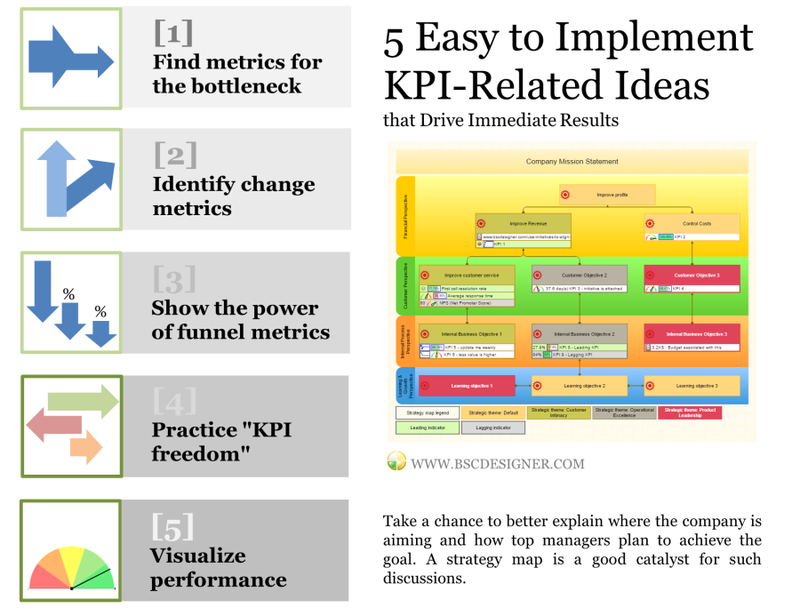 These were 5 actionable ideas for the KPIs. I hope you found at least 1 that you will try. Feel free to share your experience in the comments. Implementing retrospective reviews and transparency rather than mandating goals and using formal reporting. Strategy or balanced scorecards incorporate many ideas of agility, but even the best training and respective implementation won’t be able to change the culture in the companies where a certain level of business maturity was not yet achieved. “Soft” parts – culture, values, and management skills. When analyzing the issues mentioned above we see that some of them appeared because of the problems with strategy maps and performance indicators (“hardware” part of the scorecard), but in most cases the real problem is with the management culture in the company or what we call “soft” parts of the scorecard. 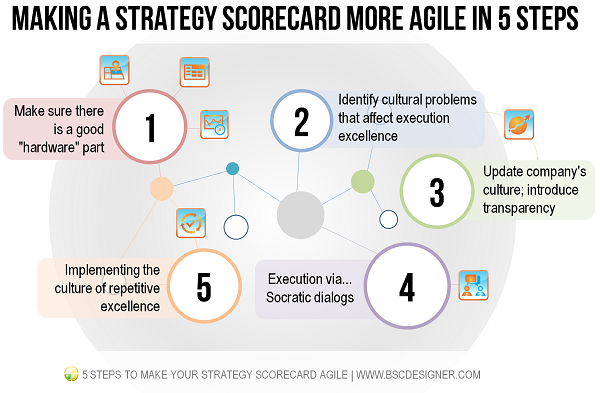 The solution is to work on the “soft” parts of the scorecard, and implement some ideas promoted under the “agile” buzz word. A well-described strategy with business goals and with the cause-and-effect logic that stands behind these goals. A set of well-defined leading and lagging indicators aligned with important business goals. A formal accountability via action plans aligned with business goals and performance indicators. A good balanced scorecard software is used (try our BSC Designer) for strategy visualization and automation of the data input. This “hardware” part is a necessary base to develop a “soft” part. The problems with continuous usage of the scorecard. Instead of fixing the mentioned problems (they are actually just the symptoms), I’d suggest to focus on the leading factors. In 99% of the cases the problem is actually at the cultural level. A company wants to improve customer service by focusing on “Time to resolve problem rate” indicator; but employees start calling to each other with the only goal being one to game the indicator. Get rid of the KPIs that are the part of “carrot and stick” motivation model! The execution is not just about monitoring indicators value – properly defined and explained business goals are much more important. A company wants employees to take into account business context and collaborate with other departments when working on the project, but when we review the actual work flow, we see that it looks like isolated silos where teams are at war and don’t exchange any ideas. Break silos! Get people from different business units into one room, start the discussion around your strategy and how you are going to execute it! Employees are asked to achieve excellence in whatever they do, but was the excellence achieved in the management itself? The execution is not just about setting stretch goals and assigning budgets, it is more about the discussion and education that leads people to understand the problem better and come up with a good solution. Learn to execute! (See Step 4 below). One of the things that you might change right away is to introduce more transparency to your business by start talking about your strategy. In agile, the term “transparency” is used often. It doesn’t mean you need to publish all your plans on the Internet and ask your competitors to review them. No, we don’t want to reduce things to the absurd. But how can you possibly ask your team members to contribute when they don’t have a clear picture of where the company is going. Think about this! The next time you are going to talk with your team about “objectives” and “tasks” make sure that you have explained the strategy context well enough. Consider achieving more transparency in other aspects – from marketing to the incentives and rewards. It’s not about letting people know your secrets or not, it is more about building trust between leader and the team. What about execution? I assume you don’t have any difficulties in setting business goals, and aligning specific action plans with these goals. Hopefully you’ll achieve success, but what will you do if you don’t? Do you actually lead your team or just give out orders? Look at your strategy map! Are those cause-and-effect links between business goals defined on high-level only (=useless) or there is good understanding of why and how your team is going to achieve these goals? Understand nuances of the challenge and respectively come up with better solutions. That’s what execution is, it is about educating your team, not about mandating goals from top to bottom and waiting for the KPIs to return into the green zone. Were agreed goals achieved? What was done well? Where can be improved? What story do performance indicators tell you today? One of the best books on the topic of execution is “Execution – The discipline of getting things done” . It is an excellent real-life guide on improving execution style. Before reading the book, I recommend starting with this short interview  with one of the co-authors – Larry Bossidy – to make sure that your management style actually resonates with his ideas. If they actually support the culture that you want to build? If your leadership efforts create the right habits? Probably instead of finding another KPI you’d better find a keystone habit like we discussed in this article before. I hope with these 5 steps you’ll be on the right track in achieving agility for your business scorecard. It’s just the beginning of a very interesting journey (don’t forget to share your thoughts and road stories in the comment box below), that hopefully will not only update your performance management approach, but will bring a culture of continuous excellence to your team.